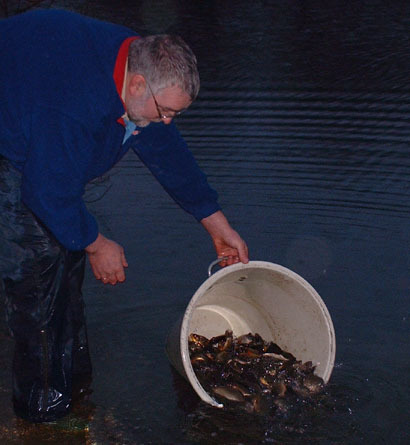 As agreed at the April 2002 Members meeting a supply of Crucian Carp for the Bailey Bridge pit has finally been secured (third time lucky!). 290 4-6 inch fish and 235 6-8 inch fish costing a total of £1071 were stocked on 16th December. So please make sure they stay put and no using for livebaits as they cost too much. It will be interesting to see how well they do and how catchable they are in the spring, as Crucian Carp are notoriously tricky to catch. Pictures below show the stocking. One of several bucket fulls into the bailey bridge pit. This is where all the permit money goes! !